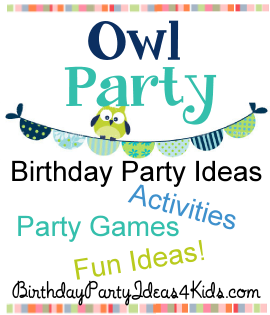 Owl Birthday Party ideas for kids of all ages! Fun Owl themed party games and activities that will have every guest involved and having fun at the party. Mix and match your favorite games and activities to make the perfect party to fit your child and their friends. Teams try to fill their container with birdseed the fastest. Divide players into teams. Each team should have a large bowl filled with birdseed at their starting point and a small paper or plastic cup. At the other end of the playing field set up two containers that are equal in size such as empty gallon milk containers (the small opening of the milk jugs make the relay more challenging and easier to determine who wins at the end of the game). On “go” one at a time players take their teams plastic cup, fill it with birdseed and then run and dump it into their teams container. Then they run back and hand off the cup to the next player. First team who fill their container wins! Give each player a feather. Have the players try to keep their feathers in the air for 1 minute by only using their breathe. To make it more difficult add another feather so they have to keep 2 feathers in the air at the same time. Divide party guests in to 2 teams. Each team member gets a Dixie style cup. Have the players in each team stand (or sit inside) in a line. At one end of the line set up a dish with 25 sunflower seeds and at the other end of each line set up an empty dish. On “go” the first person in line will scoop out a sunflower seed into their cup and put it in the next players cup, then the 2nd player will pass the acorn to the 3rd player in line and so on until the last player in line puts the sunflower seed in the dish at the end of the line. Race to see who can move their seeds down the line the fastest. Play 2 different ways: One seed in the line at a time or let the kids pass several down the line. Play a few rounds so the party guests can get the hang of the game. -Have the players stand far apart (5 feet) so they have to run to the next player to get their seeds and to pass them. -Have players sit in a circle. -On the second round have players reverse direction and pass the seeds back to the front of the line. Use a feather boa as the traditional Limbo stick in a fun feather themed game of Limbo. 2 adults hold each end of the feather boa and players line up to take turns going under the boa. Lower the boa each time the whole group of players has gone though. Put music on for younger kids and let them dance as they go under the boa and wait in the line. Have party guests paint small wooden birdhouses that they can take home as a party favor after the party. Buy or make plain cupcakes (or large cookies) and let party guests decorate them with lots of different toppings. Set out 4 cupcakes per guests. In large bowls place different fun toppings such as sprinkles, chocolate chips, red hots, coconut flakes, small candies, etc. and place them in the middle of the activity table. Give each guest 5 or 6 small paper Dixie cups and spoon their favorite toppings into the cups. Then guests take the cups and can decorate their cupcakes. Send cupcakes home in a small box as a party favor for them to enjoy after the party.